Christmas Sale 15% Off Storewide In Schultz Dental Loupes Now! There is no doubt, Christmas is already in the air. Everywhere you look, you can see different sizes of trees ornamented with colorful decorative handicrafts. Colorful lights are dancing at night. Family members and friends gather together to celebrate the birth of Jesus Christ, and to share happy moments. Little children and even grown-ups are getting excited to open their gifts. While some people are thoroughly thinking about what to cook on Christmas eve and to pull out their best traditional Christmas specialties, others are excited to see what is being prepared on the table. Some people are busy as a bee preparing for their long list of things to buy and to give to their loved ones while others are preoccupied packing gifts for the community especially for those kids in the orphanage and older people in the house of the aged. In this season of loving, sharing, and gift giving we bring to you our gift for all our avid and new customers. Schultz Loupes is now offering a hefty 15% off for all our already affordable dental and surgical loupes and headlights. 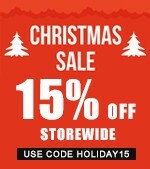 You simply need to enter the code HOLIDAY15 upon check out to avail of our storewide 15% off Christmas sale. What's with our 30-day risk-free trial? We are confident with the quality of each of the products that came out of our laboratory. If in case you are not satisfied with the quality of the dental loupes or headlight that you have just bought after using it for a few days or weeks, you can always contact our friendly and accommodating customer service representatives and communicate your thoughts and intentions to them. Our 30-day risk-free trial allows you to have your product exchanged if you are not happy with its quality or if it does not fit you well. Also, if you think that you need a pair of dental optical loupes with magnification power that is higher than that of your new product, you can also ask us to have it replaced to meet your requirements and needs. If in case you have decided to no longer use any of our loupes, which we doubt you would, our 30-day money back guarantee will allow you to get a refund. However, in order to get a full refund, you should return the product in "like new" condition. There should be no sign of use, scratches, or damages. Also, you need to ship back to us the warranty card and other items (if there are any) that were included in the product packaging. When contacting our customer service, do not forget to give the Delivery Confirmation Number. Failure to meet any of these requirements will nullify your claim for a full refund. Instead of getting a full refund, you will be charged a 50% restocking fee. Don't wait for another day or week before you finally decide to get your own dental magnification loupes. Purchase your dream loupes now while they are still on sale! Plus, you can also avail of our 30-day money back guarantee. For a risk-free trial plus big discount, use the code HOLIDAY15 at checkout. Happy shopping! This entry was posted in Dental industry news | Schultz Dental surgical blogBy Roger Jing On Dec 08, 2017 .